Growing up, we lived near the families of two of my dad’s brothers and I was close to a couple of cousins who were about my age. As my younger siblings began arriving, so did younger cousins—all of whom we considered the “little kids.” It’s amazing how distant five or six years seem during our formative years, and how such age differences shrink into insignificance as adults. 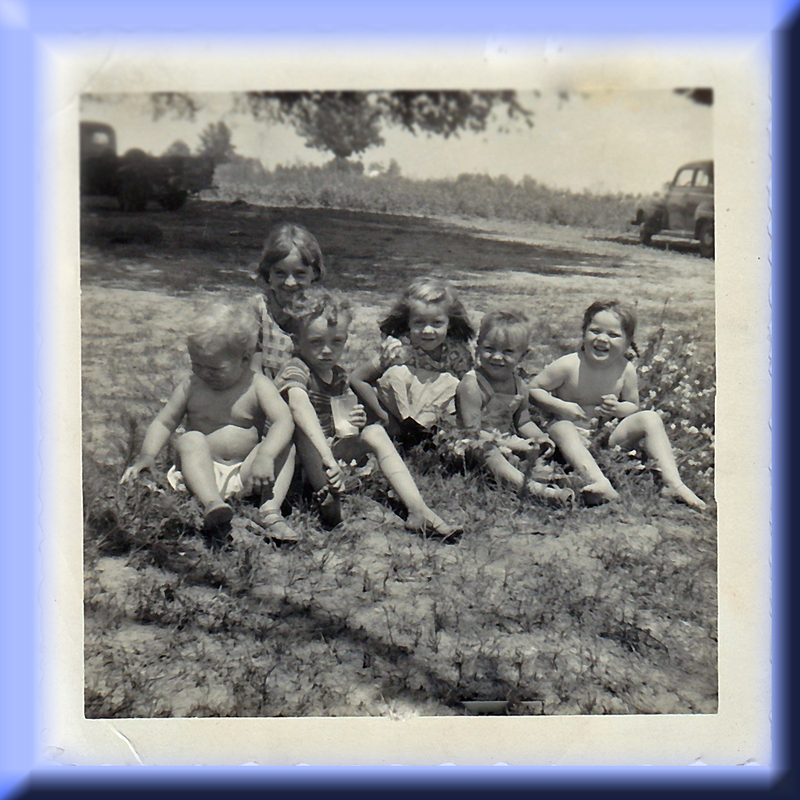 Crystal was one of the little kids, so after my family moved away when I was seventeen we lost touch for many years. About five years ago Crystal started calling occasionally and we’d talk awhile, but still didn’t know one another well. Eventually though, we discovered that we are both passionate about God in a way that many others in our extended family are not; and a spiritual bond began to form. I was walking the puppies, and out near the edge of our mowed lawn is the wilder part where the more natural grasses grow up to a height of about 18 inches. It’s early spring and the wildflowers have just started to bloom here and there. Over the years, as I’ve taken photos of our flowers, I’ve found that some of my very favorites are the tiny wild flowers. At first glance, looking down at them from about five feet above, they don’t look all that impressive. But when I bend down and focus on the tiny blooms, some not more than an inch across, I am amazed to see the glorious details of the little petals and stamens, complete with pollen. This day, walking near the edge of the lawn, I noticed a lone grouping of three fronds of one of these little Missouri wildflowers. 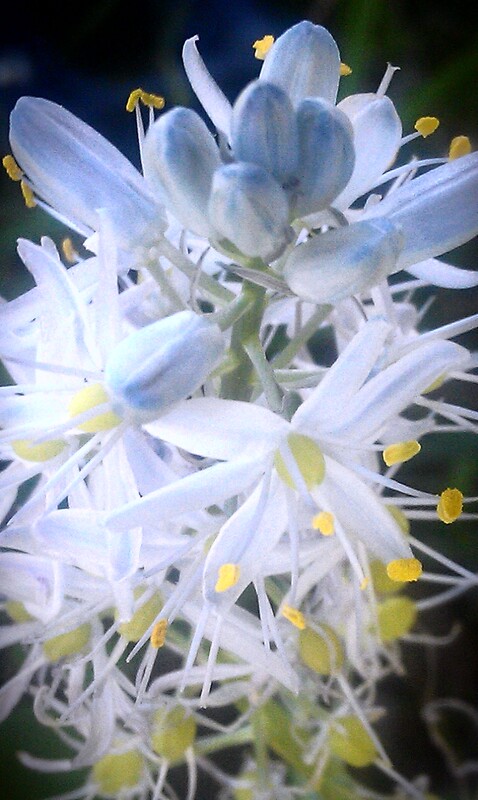 It was white and delicate with little yellow stamens. Just then, a huge black-and-yellow-striped bumblebee, about an inch long and a half-inch wide, buzzed in and landed on the tiny wildflower. This is the kind of bumblebee I used to see growing up in Northern California where we used to love to catch them in the lupine bushes in quart glass Mason jars because we always liked to hear them “sing” as they buzzed. It was always fun to find one that had lots of pollen dots on its back legs, gathered and distributed along its travels. I’ve since learned that many flowers don’t pollinate unless a bee comes along to do it for them. So, here was this little lone wildflower and I watched, mesmerized, as the big bumblebee adeptly and carefully visited each and every little open petal. I felt ashamed that I had so quickly judged the seemingly insignificant wildflower. I wasn’t the only one to enjoy its beauty—I was but one of many, including the Good Lord up above, the angels, and all the other birds and bees flying about. Suddenly I didn’t feel like such a lone wildflower living out in the wilderness. The Spirit spoke to me and said that I am never alone, but that God Himself always makes plans to visit me and deposit within me bits of Himself, where they can stay forever, producing His life. Then, as I am filled with Him, I can be like the bumblebee and spread the beauty of His love to other flowers (people) I come in contact with. May we all decide now to be like industrious little bumblebees, pollinating with His life all the wildflowers and cultivated flowers with whom the LORD allows us to interact. We do this by sharing His light; by walking in His light. We do this by not reacting badly, even when others do so. We do this when we shine with His glory because we have been swimming in it ourselves, and it just exudes out of us effortlessly. What wonderful details and symmetry God has placed on our little blue planet! My counsin Barbara expertly tweaked my little story I wrote to her a few days ago…Here it is as she posted it. This reduced me to tears. Both of anger and thankfulness all mixed up. Here, where I live I have a scraggy strip of tumbled greenery alongside a small but adequate section of grass for my autistic son’s trampoline. The flowers that spring up in that grassy patch are incredibly beautiful…many varieties that have survived the rough weather and lack of attention to tend the soil properly. I have stood and marvelled and occasionally looked closer at the design of the flowers but relegated the experience to that of nature photographers getting sentimental when there’s a lot better subject matter in the world to consider and photograph. However, this piece of Crystal’s writing came at a perfect time for me, a time when Jesus is showing his gentle, supremely able reality that is hidden so much behind demands on us that preclude such a healing connection with who he genuinely is. So yes, let’s get closer to the truth (reality) of this superb person, Jesus, and start to manifest that relationship with ease and at his pace in all his power and authority…gently…words of ‘spirit and life’ seem to me to be anywhere where he is revealed. Anger? Yes….but I know he can take it…anger at the imperfections and time-wasting experiences of life that aren’t yet enfolded into his re-making of me and others…but it’ll come. I think it’s time for a few bumble bees to arrive (seasonal, right?!) and Crystal, thank you. Thanks Stephen. “This superb person”–what a wonderful way to describe Jesus! And, I love your reference to the seasonal nature of bumblebees. It’s a good reminder of the seasonal nature of our lives and the ways God works in and through us.